Watch a video of the awards ceremony here. 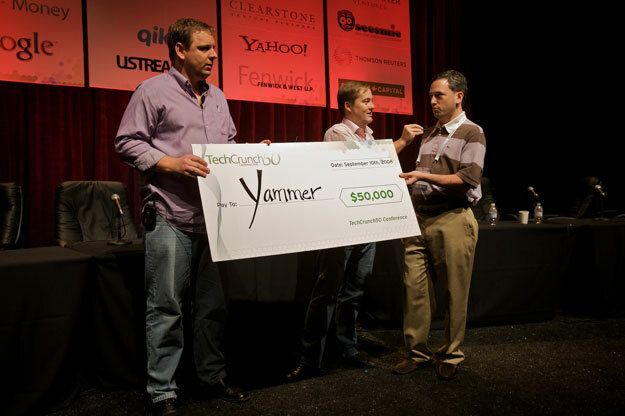 Three jam-packed days, and 52 startup demos later, we finally have a winner for this year’s TechCrunch50. Every day, the presentations just seemed to get stronger and stronger. There were so many strong contenders this year that we are awarding five jury selection prizes, in addition to the top prize. But there must be a winner, and that winner is…Yammer . Yammer is Twitter with a business model. Created by an existing company, Geni, to scratch its own itch, Yammer takes the familiar Twitter messaging system and applies it to internal corporate communications. There is such a huge demand for this type of service that 10,000 people and 2,000 organizations signed up for the service the first day it launched on Monday. Anyone with a corporate email can sign up and follow other people in their company. But if a company wants to claim its users, and gain administrative control over them, they will have to pay. It’s a brilliant business model. (Watch a video of the the winning demo). Atmosphir is a gaming platform that anyone can use to create their own immersive, 3D levels. The tool works by dragging and dropping level elements into place – pieces of land, bridges, hazards, etc. To play your level, all you have to do is hit “play” and you can even go back to the editor after entering gameplay. Atmosphir is available for Macs, PCs and Linux machines and was developed by Minor Studios. (Watch the video). FitBit produces a small gadget that can be clipped discreetly to your clothes. It tracks your movement throughout the day and delivers reports on how active you’ve been. These reports can be accessed through a website and used to learn not only how many steps you’ve taken but your sleeping patterns and caloric burn as well. GoodGuide helps consumers find better and more comprehensive information about the products they buy and the companies that make those products. The site ranks products on their health, environmental and social “goodness”, empowering consumers to buy conscientiously. The founders say they have enlisted the support of scientists and technologies, as well as hundreds of information sources, to make the service as accurate and informative as possible. (Watch the video). Grockit is an online, interactive learning tool that brings students together to answer quizzes with each other. The startup has raised $10 million for what it’s calling a “Massively Multi Player Online Learning Game”, which takes its cue from World of Warcraft and applies that game’s concepts to SAT-like study groups. Grockit features a chat room where students can talk with one another as they deliberate over questions. They can also award each other points for their insight. (Watch the video). Swype introduced a radical new gesture-based way to input text on touch-screens. Created by Cliff Kushler, the same man who co-invented the T9 predictive text entry system found on over 3 billion phones, Swype lets you simply connect letters on a touch-screen keyboard by making squiggles between them using your finger or a stylus. (Watch the video).